Chances are, you have heard of the China Study. Back when it was first published in January of 2005, it was met with immediate praise and a warm welcome by the health community. Today, it has sold over two million copies worldwide and will forever be one of the classics of nutrition-based literature. In a nutshell, The China Study examines the relationship between consuming animal products and the occurrence of chronic, long-term disease, including heart disease, diabetes and a number of different types of cancer. If you haven’t had a chance to take a look at this ground-breaking book by T. Colin Campbell, I highly recommend that you pick up a copy the next time you are browsing around your local bookstore. Almost twenty years later, The China Study is just as relevant today as it was when it was first published and will arm you with a ton of great information to inspire you to live in optimum health. In this new edition of the accompanying cookbook, written by the author’s daughter, you get a healthy dose of the science behind the China Study right on your dinner plate. 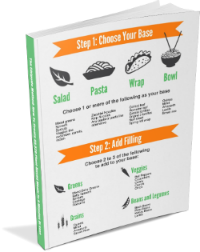 The China Study Cookbook includes a number of new recipes (175 in total) that follow core China Study principles, are easy to prepare and use minimal sugar and salt. This revised and expanded edition includes some truly mouth-watering photos to go along with the recipes. It was so hard to choose just one recipe to use for this post because they all looked so good! The book also takes you behind-the-scenes into author LeAnne Campbell’s garden in the Dominican Republic and inside the work of her organization, Global Roots. 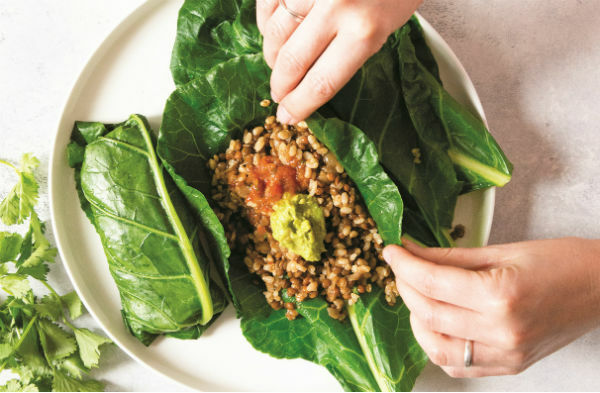 To celebrate the launch of her new book, LeAnn gave us permission to share a recipe that we think is perfect for those serious about living in peak health. Check out the recipe below and let us know what you think! 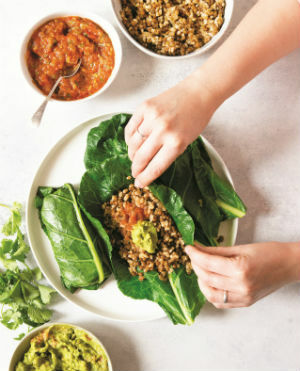 Created by LeeAnn Campbell, this light and filling wrap recipe is perfect for a light lunch or easy-to-prep dinner. Not many people are familiar with how to use collard greens and I think this is a great way to start. Collard leaves make a great substitute for bread and tortillas. For those who are gluten-free or for those who are just looking to eat more green veggies, this recipe is for you. The collard greens just need a quick blanch in boiling water to soften them and make them a bit more palatable for the wraps. To assemble the wraps, pile all the ingredients in the middle of each leaf and then fold over as you would a burrito. Feel free to get as creative as you would like with this recipe – the possibilities are endless with a veggie wrap! Prepare the collard leaves by first trimming the middle stem to the same thickness as the rest of the leaf. Place each leaf in a large saucepan of boiling water for 30 seconds and then transfer to cool water for 1 minute. Remove the leaves from the water and pat dry. Set aside. Cook brown rice according to package directions. Set aside. In a medium-size saucepan, saute onion and garlic in 2 tablespoons of vegetable broth over medium-high heat for about 3 minutes, or until onion browns. Add lentils, chili powder, cumin, paprika, oregano, salt, and hot sauce; cook and stir for 1 minute. Add remaining vegetable broth and bring to a boil. Reduce heat to low, cover, and simmer until lentils are tender, 25–30 minutes. Uncover and continue cooking until mixture is slightly thickened, 6–8 minutes. Stir in salsa. 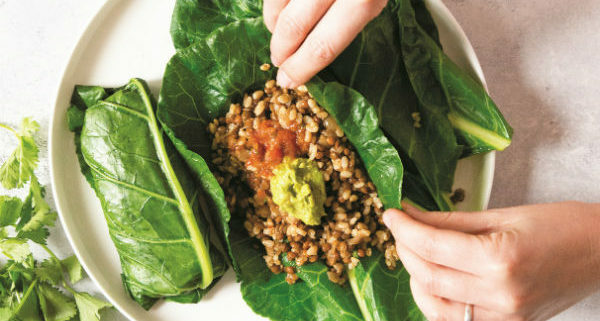 Prepare the collard wraps by first spooning 2–3 tablespoons of rice on top of each leaf. Then spoon about 2–3 tablespoons lentil mixture on top of the rice, and finish by adding 2 heaping tablespoons guacamole. Fold the collard leaf like a burrito, by first folding the bottom up, then the sides in. Enjoy! Preheat oven to 400˚F. Place tomatoes and garlic cloves on a parchment-lined baking sheet and cook for 45–50 minutes. Place tomatoes, garlic, and remaining ingredients in a food processor and pulse 5–6 times, until blended but still chunky. Scoop avocado flesh into a medium-size bowl and mash with a fork. Stir in salsa or tomatillo sauce. Season with lemon juice and salt. Mix well. 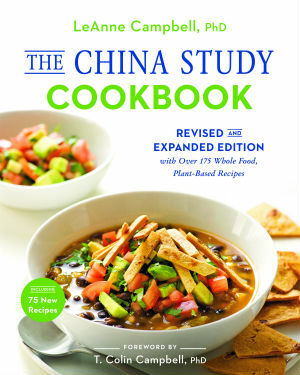 LeeAnn and BenBella Books Publishing has been kind enough to provide a copy of The China Study Cookbook to our community, and you can enter to win! We’ll choose a winner by random drawing on August 24th, 2018. *Note: Giveaway is only open to residents of the US and Canada. From The China Study Cookbook by LeAnne Campbell, Phd; BenBella Books, 2018. Many of us choose to eat a plant-based diet out of compassion and respect for animals, but choosing to fill our plates with fresh fruits and vegetables does more than just protect the natural environment and the animals who call it home. Even if it’s not our primary motivation, eating a whole-foods, plant-based diet has been proven to be a powerful aid in preventing and reversing chronic disease. Each time we sit down to eat in a way that supports the health of the planet, we support our own health in the process. Eating a diet that’s centered around plants has a natural healing and cleansing effect on the body, especially as we introduce more raw foods, but many of us feel called to take a more active approach in our cleansing and detoxifying process. And now just happens to be the perfect time to do that! As we move into spring, the days are getting longer and the temperatures are getting warmer. Life is reawakening all over the planet and we start to feel a shift in our own bodies and minds. In Traditional Chinese Medicine, it is thought that the cycles and rhythms of the human body are closely intertwined with nature. During the cold, winter months, our bodies gravitate towards semi-hibernation. We slow down, crave heavier, more comforting foods, and spend more time in leisurely activities like reading and watching movies. In the spring, as new life emerges and regenerates itself, we feel naturally drawn towards being more active, spending more time outdoors, and eating lighter, more energizing foods. This presents a great opportunity to shed a little excess weight and clean out the toxins that have been accumulated and stored over the course of our winter dormancy. We recently found a recipe on the Eat Well, Enjoy Life blog that we thought would be perfect for early spring when we’re slowly waking from our winter slumber. It’s a recipe that’s hearty and fulfilling, but light and full of detoxifying ingredients at the same time. 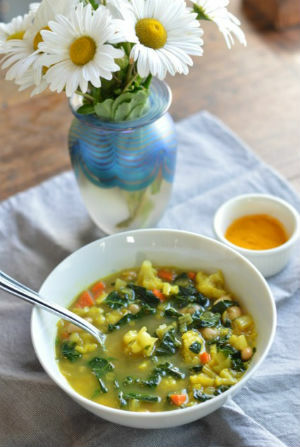 Ingrid DeHart’s vegetable turmeric soup is full of flavorful ingredients and healing spices that will please your palate and give your digestive system the boost it needs to cleanse from the inside out. The turmeric fights inflammation and reduces gas and bloating, while the ginger and garlic stimulate the digestive tract to shed excess mucous and re-balance the intestinal wall. The other ingredients in this recipe, like coconut oil, carrots and kale all have well-known health benefits and healing properties of their own. 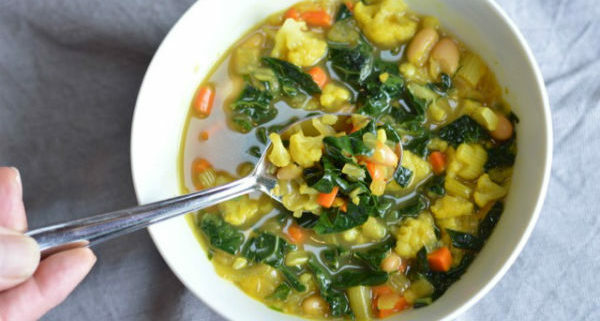 No special tools or kitchen skills are required to make this warming, healing soup. Just a knife, a cutting board and a pot to throw everything together in will suffice. 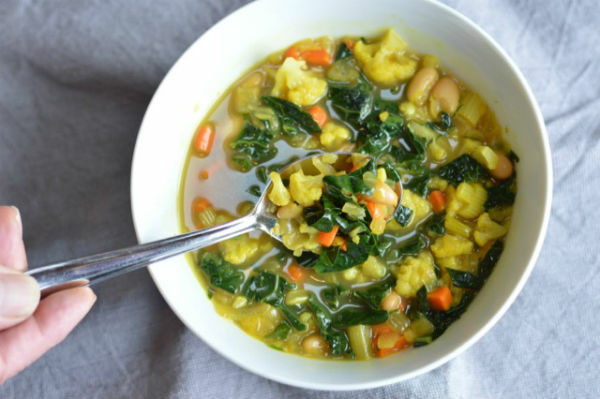 If you’re looking to shed a few excess pounds or just want a little more spring in your step as we move into spring, we hope you’ll give our spring-cleansing vegetable turmeric soup a try! Preparation time is around 20 minutes and the soup will take an additional 30 minutes to cook. One big pot will easily serve a family of 4. Leftovers can be stored in the refrigerator for 2 to 3 days. Note: You could alter this recipe in a number of ways. We love the combination of flavors that Ingrid has created in this recipe, but the vegetables used are merely suggestions. Feel free to use whatever you have lying around the house or really love. The ginger and garlic do most of the cleansing work in this recipe, but if you’re choosing to avoid hot, stimulating spices and herbs, feel free to omit them. Turmeric is incredibly purifying on it’s own. For those eating a paleo diet, feel free to omit the beans. This is the perfect time of year to start incorporating lighter, more cleansing foods back into your diet. Thanks to Ingrid DeHart and Eat Well, Enjoy Life for sharing this recipe! Heat the coconut oil in a large soup pot over medium-low. Add onion and stir. Cook for 5-7 minutes, until the onions begin to brown. Add carrots and celery, cook for 3-5 more minutes, until the vegetables soften. Add turmeric, garlic and ginger; stir until the vegetables are coated. Cook for 1 minute, until fragrant. Add broth or water, salt, and pepper; stir. Bring to a boil. Add cauliflower. Cover and reduce heat. Simmer for 10-15 minutes, until cauliflower is tender. When the cauliflower is fork tender, add beans and kale. Cook until the kale is slightly wilted, 2-3 minutes. Over time, I’ve become better and better at navigating social situations while making food choices that align with my values. I get better at the dance of going out to eat with friends, going to parties, and traveling while enjoying myself without falling off track or feeling like an outsider. But last week I was at a conference in Baltimore for my work as a web developer, and the food issue was especially challenging. Take a look at this group text from last week as our team was deciding where to eat. 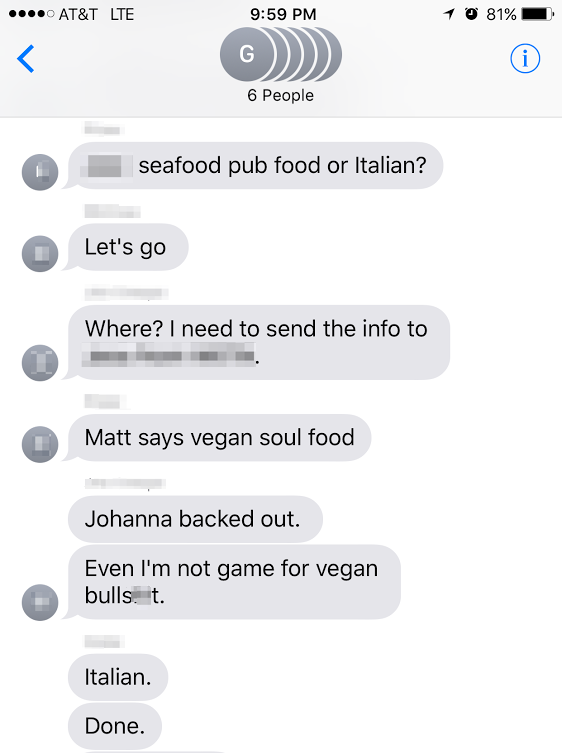 I mentioned that I was going to slip away to a vegan, soul food restaurant I had heard about, but didn’t mean to suggest that the whole group should go (someone else texted that to the group). I’m close friends with the guy who sent this text and talk openly about these things with him. I didn’t take it personally, as the text might suggest. But still, it’s a good representation of the kind of social pressures that many of us have to deal with on a nearly constant basis. And it’s not just limited to conversations between friends and family. 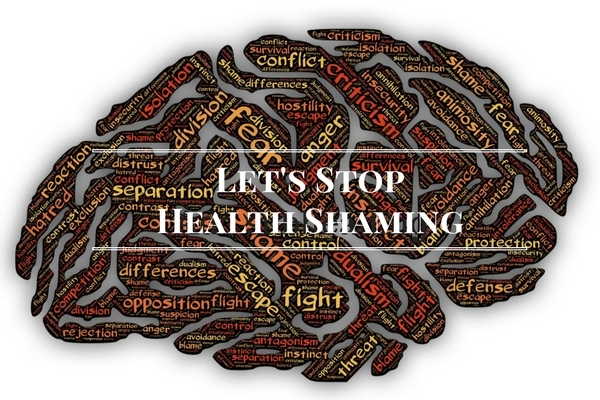 Blatant examples of health shaming can be found in the media and in pop culture at large. There is no doubt that wellness services and products are largely available only to those of a certain socio-economic class. We need to do more to make healthful food available and affordable to everyone. And as wellness has become trendier, it HAS become a certain kind of status symbol. But frankly, I find it seriously awesome that people may be more interested in buying organic produce, taking a yoga or meditation class, or sipping a green juice instead of buying hummers and huge houses. TV shows love to make fun of plant-based eaters and talk about how gross raw food is. Journalists love to publish stories about how there isn’t any evidence to support claims made about the benefits of supplements and detoxification. I’m not saying that we should ignore the science. It is true that certain supplements can do more harm than good. We need to do our due diligence by consulting with qualified medical professionals and pay close attention to the data being released by independent quality-control companies like Labdoor that test supplements for their safety and purity. There may not be many scientific studies that show how certain foods aid in the detoxification process, but I’ve personally been witness to some incredible health transformations over the years. When I worked at the Tree of Life, many of the guests arriving with Type 2 diabetes were off all medication and had a normal fasting blood sugar level by the time they left – and that was after just three weeks on a plant-based, low-glycemic diet. I don’t know if they were “detoxing” or not, but I can tell you that they made life-changing improvements to their health and well-being. I’ve been doing a lot of outreach for our new, big project lately, fueled by some truly shocking facts. 1 out of 4 people continue to die from heart disease.2 As many as 1 in 3 adults could have diabetes by 2050 if current trends continue.3 More than 2 out of 3 Americans are considered overweight or obese.4 These chronic conditions are epidemic. Yet we already have a solution to this crisis. The hard truth is that so many of our loved-ones will experience a significant decline in their quality of life and eventually die, in part, because of what they choose to eat. The Standard American Diet is literally killing us, has a huge environmental impact and costs us over a trillion dollars each year in medical bills. It’s making the people that we love sick. This is too important for me to not speak up. This isn’t a trend. This is a movement that must grow, because we have no other option than to radically change our current food culture if we want to live happy, healthy lives and do better for our planet. So how about we stop shaming people who choose to buy $10 juices, and instead focus on making real, organic, plant-based food more available to everyone, regardless of their socio-economic status. Let’s stop making fun of people who are gluten-free, vegan, vegetarian, paleo or whatever else they are because they choose to take on the difficult task of standing in opposition to the cultural norm in order to create better health for themselves and their families. Let’s stop fighting about what diet is best, and celebrate each and every small victory that moves people towards eating more veggies and less processed food. 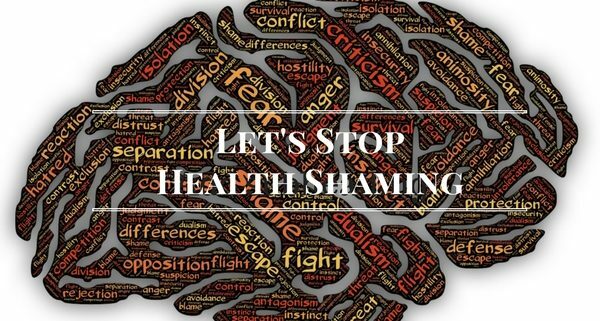 We need to shift the cultural conversation and stop alienating those of us who have the courage to make personal changes in a society that continues to marginalize and shame them. You might feel like an outsider in your community, but our movement is growing. Our strength and numbers are growing. We are in this together, and the more that we create acceptance, the more the tides will turn. National Center for Chronic Disease Prevention and Health Promotion. “Chronic Disease Overview.” Centers for Disease Control and Prevention. Centers for Disease Control and Prevention, 23 Feb. 2016. Web. 28 Mar. 2017. National Center for Chronic Disease Prevention and Health Promotion. “Number of Americans with Diabetes Projected to Double or Triple by 2050.” Centers for Disease Control and Prevention. Centers for Disease Control and Prevention, 22 Oct. 2010. Web. 03 May 2017. “Overweight & Obesity Statistics.” National Institutes of Health. U.S. Department of Health and Human Services, n.d. Web. 03 May 2017. Chiuve, S. E., M. L. McCullough, F. M. Sacks, and E. B. Rimm. “Healthy Lifestyle Factors in the Primary Prevention of Coronary Heart Disease among Men: Benefits among Users and Nonusers of Lipid-lowering and Antihypertensive Medications.” Circulation. U.S. National Library of Medicine, 11 July 2006. Web. 28 Mar. 2017. Akesson, A., C. Weismayer, P. K. Newby, and A. Wolk. “Combined Effect of Low-risk Dietary and Lifestyle Behaviors in Primary Prevention of Myocardial Infarction in Women.”Archives of Internal Medicine. U.S. National Library of Medicine, 22 Oct. 2007. Web. 28 Mar. 2017. Hu, F. B., J. E. Manson, M. J. Stampfer, G. Colditz, S. Liu, C. G. Solomon, and W. C. Willett. “Diet, Lifestyle, and the Risk of Type 2 Diabetes Mellitus in Women.” The New England Journal of Medicine. U.S. National Library of Medicine, 13 Sept. 2001. Web. 01 Apr. 2017. Chiuve, Stephanie E., Kathryn M. Rexrode, Donna Spiegelman, Giancarlo Logroscino, JoAnn E. Manson, and Eric B. Rimm. “Primary Prevention of Stroke by Healthy Lifestyle.”Circulation. American Heart Association, Inc., 26 Aug. 2008. Web. 28 Mar. 2017. Katz, David L. “Facing The Facelessness Of Public Health: What’s The Public Got To Do With It?”. American Journal of Health Promotion 25.6 (2011): p361. Print. Tuso, Philip. “Nutritional Update For Physicians: Plant-Based Diets”. The Permanente Journal 17.2 (2013): 61-66. Web. Boseley, Sarah. “Forget Five a Day, Eat 10 Portions of Fruit and Veg to Cut Risk of Early Death.” The Guardian. Guardian News and Media, 22 Feb. 2017. Web. 28 Mar. 2017.
https://www.truewellth.org/wp-content/uploads/2017/04/EXHIBITION-1.jpg 400 600 Matt Jager https://www.truewellth.org/wp-content/uploads/2016/06/TrueWellth-HorizontalSmall.png Matt Jager2017-05-05 19:07:232017-05-05 19:07:23Stop the Health Shaming! 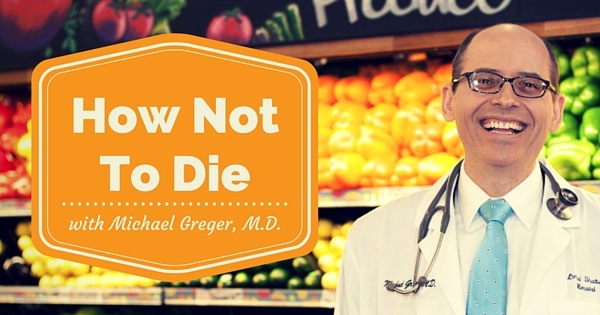 How Not To Die: How Simple Lifestyle Changes Can Eliminate Our Deadliest Diseases with Michael Greger, M.D. We are giving away a free copy of Dr. Greger’s book! To enter, fill out our 2015 reader survey. I was shocked when I found out that the leading cause of death in the United States could be eliminated by changing what’s on our plates. One out of every four Americans currently dies of heart disease — a condition that can be not only prevented, but REVERSED with a whole-food, plant-based diet. If that was the only benefit of the plant-powered path, it would still be a strong argument for making veggies the main course. Obesity, type 2 diabetes, high blood-pressure and other chronic conditions can all be improved by simple changes in diet and lifestyle. And sometimes these kinds of lifestyle interventions are more effective than prescription pills and surgeries. These powerful statistics carry a personal touch. I don’t know a single person who hasn’t been affected by one of these diseases, whether personally or through a close friend or family member. It’s absolutely heart breaking. But we can do better. Dr. Greger released his latest book last week which is taking this life-saving message to the mainstream. In How Not To Die, Dr. Greger reviews an incredible amount of medical literature in order to find the best nutrition and lifestyle interventions for the fifteen leading causes of death — diseases that claim the lives of 1.6 million Americans each year. The book is a great reference if you are looking for specific recommendations, such as the best foods for treating hypertension. Greger also provides actionable advice on how to make lifestyle changes stick, and a daily dozen checklist of foods to add to your diet to get the biggest benefit. I hope you enjoy the interview. But most importantly, please help get this critical message out. Together we can begin to fix a broken food system, a broken healthcare system, and literally save a million lives. Share this with someone that could benefit from the information. If you like this video, please subscribe to our youtube channel! Enter To Win A Free Copy Of The Book! Dr. Greger has been gracious enough to provide a copy of How Not To Die to our community, and you can enter to win! To enter, fill out our 2015 reader survey! We’ll be randomly selecting a recipient from the entires and notifying the winner on Tuesday, December 29th. UPDATE: The giveaway has now ended. Congrats to Karen R! *Note: Only open to residents of the continental US. https://www.truewellth.org/wp-content/uploads/2016/02/michaelgreger-hownottodie.jpg 315 600 Matt Jager https://www.truewellth.org/wp-content/uploads/2016/06/TrueWellth-HorizontalSmall.png Matt Jager2016-02-05 03:29:562019-01-04 21:39:14How Not To Die: How Simple Lifestyle Changes Can Eliminate Our Deadliest Diseases with Michael Greger, M.D.